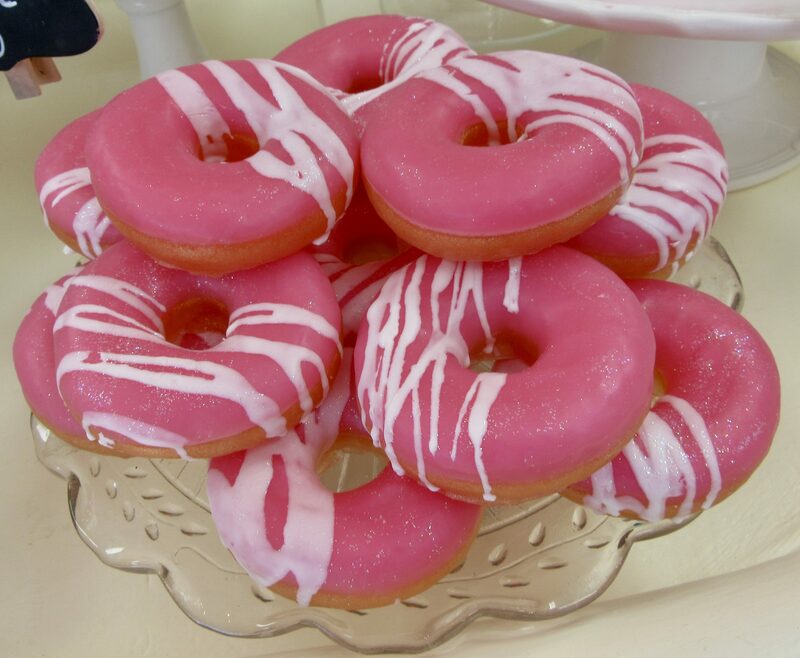 This tempting platter of mouthwatering Pink-Frosted Donuts is deceiving to the eye, for it is not actually a plate of sweet baked goods but a stack of fragrant soaps are also lovely to look at! 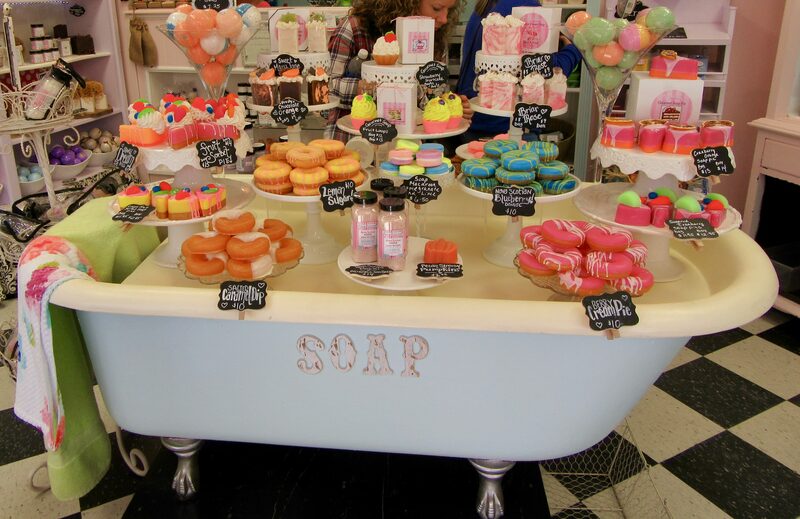 How many times each day do you think that the employees of this store, Sugar Bubbles Bath Bakery in Mahone Bay, Nova Scotia, have to ask customers to please not lick the merchandise? 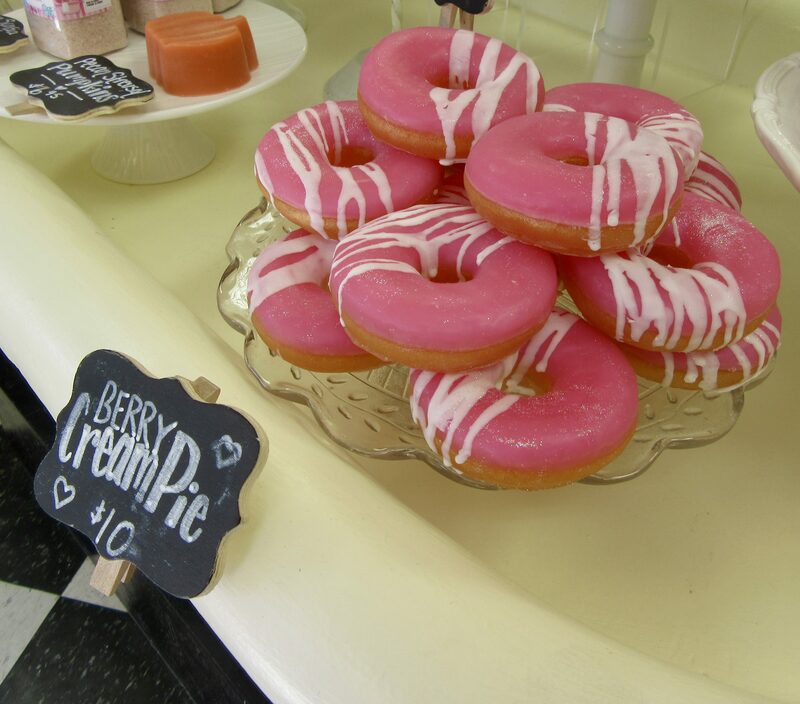 Especially when the soaps smell like delicious Berry Cream Pie! Get this fun design on a T-Shirt for just $19.95, or on a variety of hoody and sweatshirt styles, at This Link! 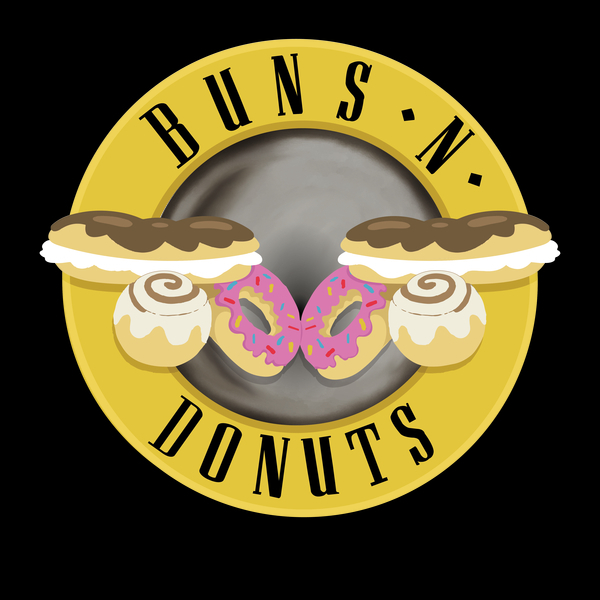 Celebrate National Donut Day All Summer With Cool Donut Swag! 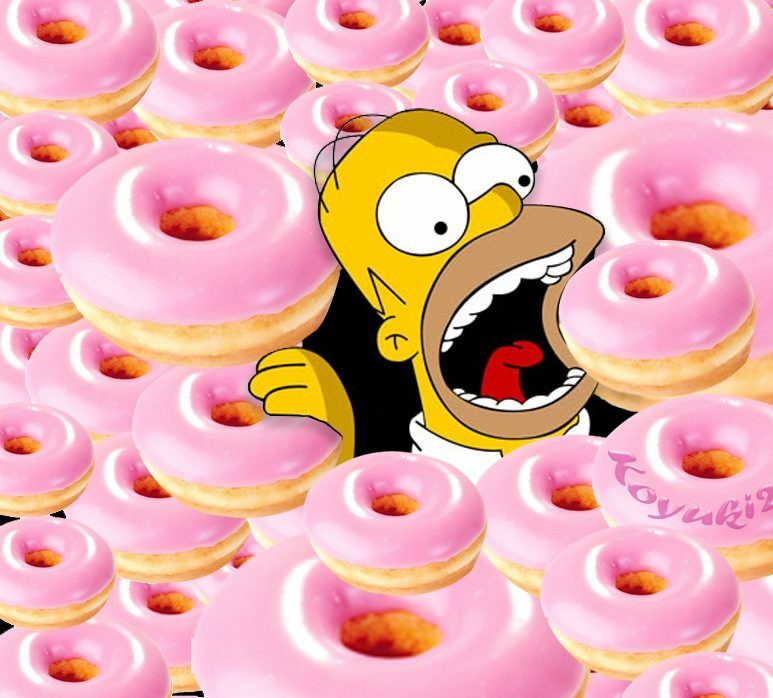 National Donut Dayfalls on the first Friday in June, but you love Donuts all year long, so one day is just not enough! 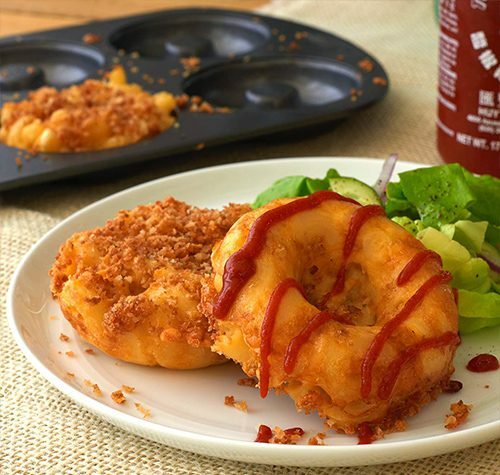 Since it’s almost summer, so how about having some fun in the sun…with donuts!? All products courtesy of Bigmouth Inc! 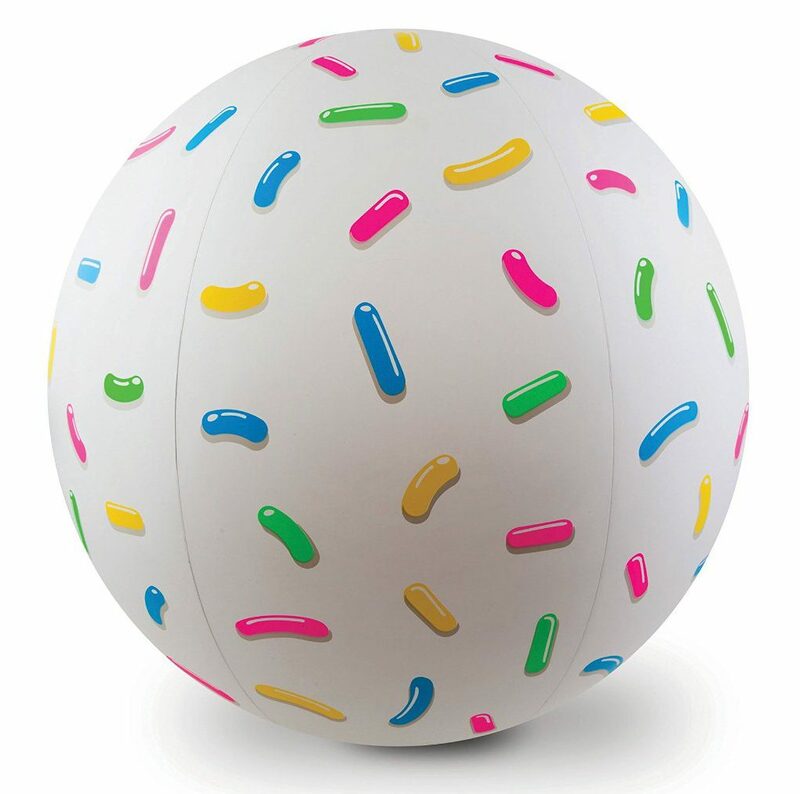 Beach volleyball and pool games will be transformed when you play with this Giant Donut Hole Beach Ball, which can be yours for the low price of $10.99 by clicking over to This Link! 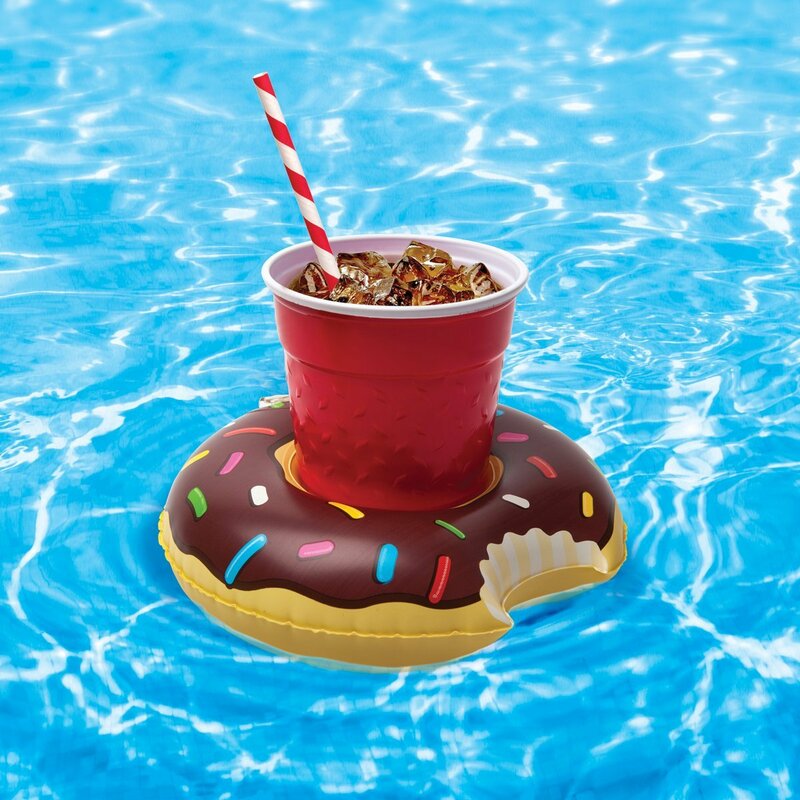 And you can float around on this Donut Pool Floatie which sells for $19.99. Of course, you will need something to hold your drink. Inflatable Donut Pool Drink Floats come in a 3 Pack for just $10.99 at This Link! 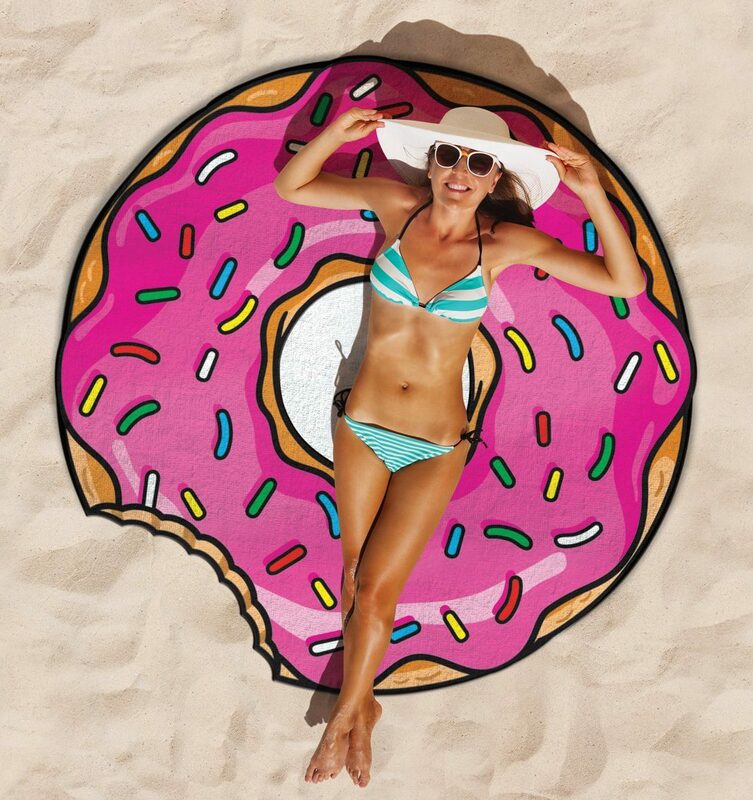 And for even more Donut-themed fun in the sun, stretch out in the sand on this Giant Donut Beach Blanket! It’s only $29.99 at This Link! Have a Delicious Summer Everyone! 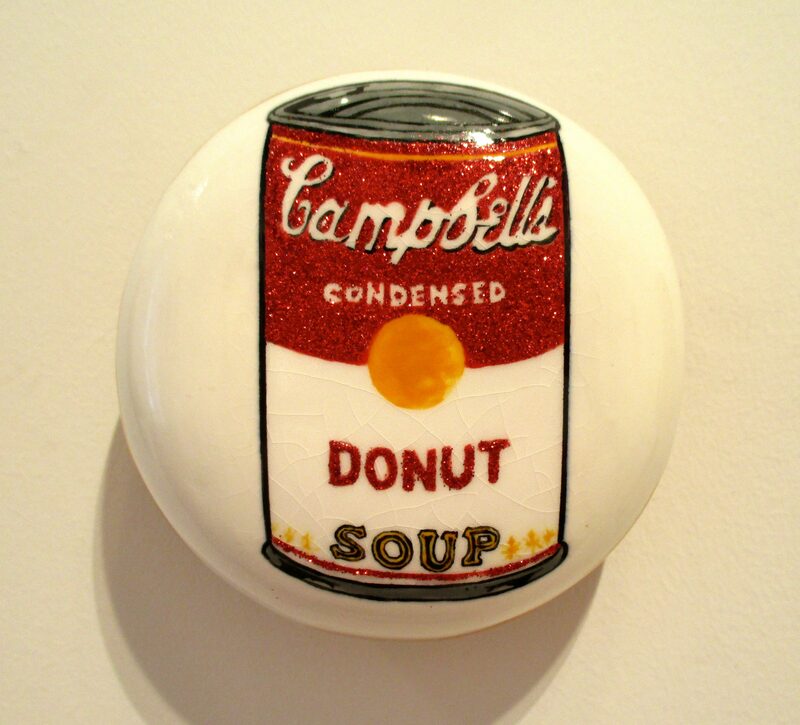 Lyons Wier Gallery Presents: Jae Yong Kim’s Pop Goes The Donut! 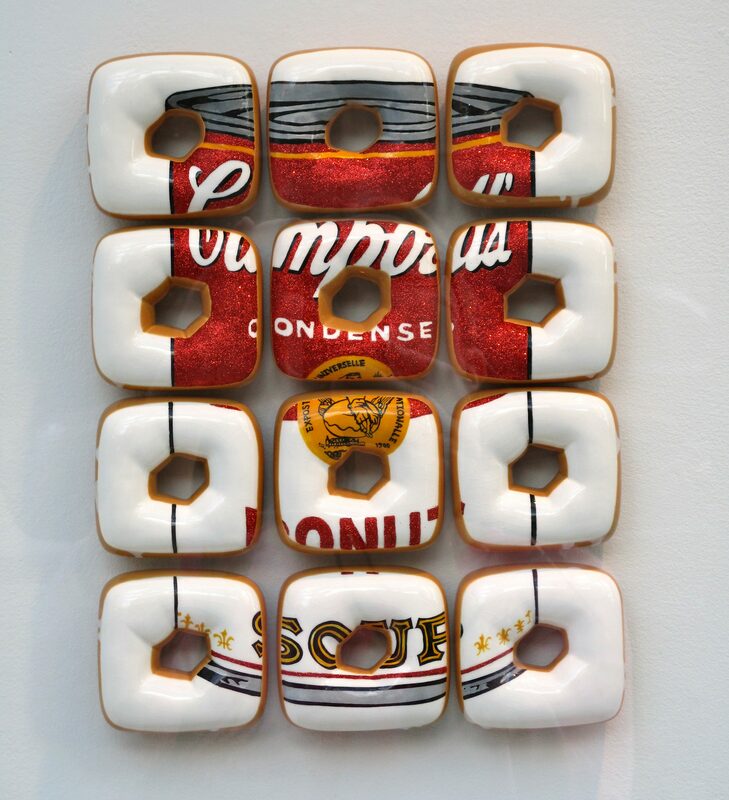 If you like Donuts and Art, then you will go crazy for Korean artist Jae Yong Kim’s latest exhibit, Pop Goes The Donut, which is up now at Lyons Wier Gallery. 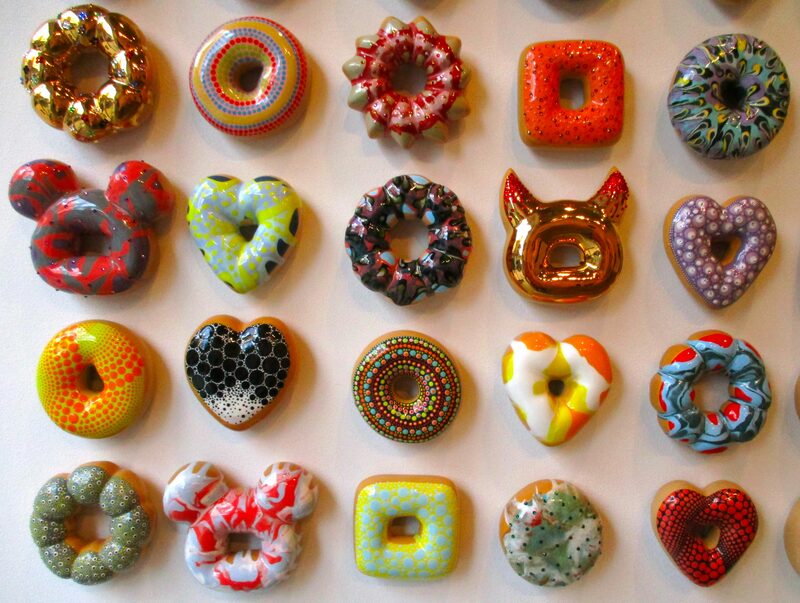 To say that these surreal, fantasy Donut sculptures look good enough to eat is a understatement. 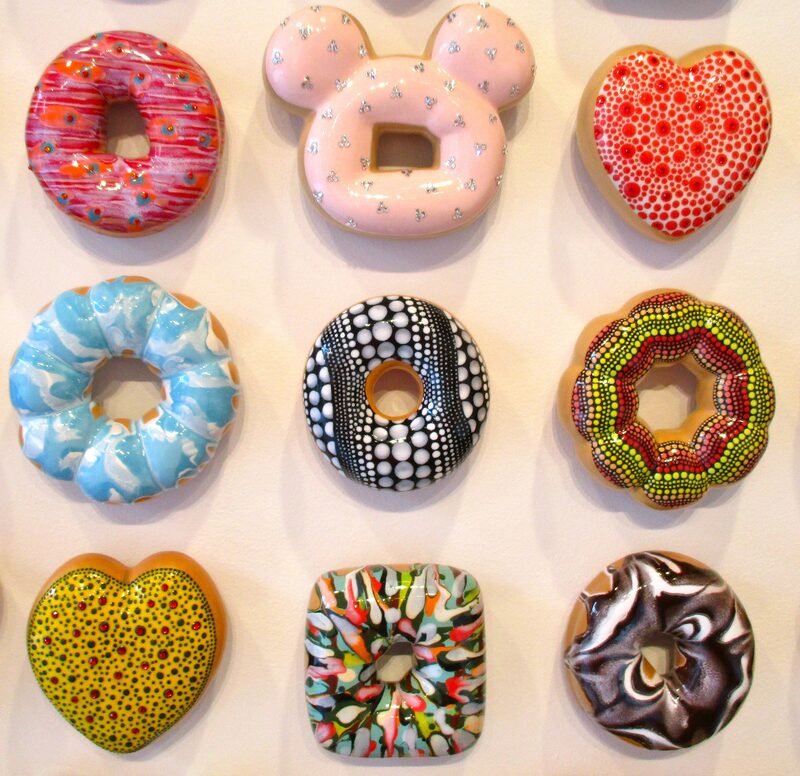 But while these donuts are glazed, they are in fact made of glazed ceramic, so resist he urge to bite into one, as it would be hard on the teeth! And just look how Instagram-ready they are! 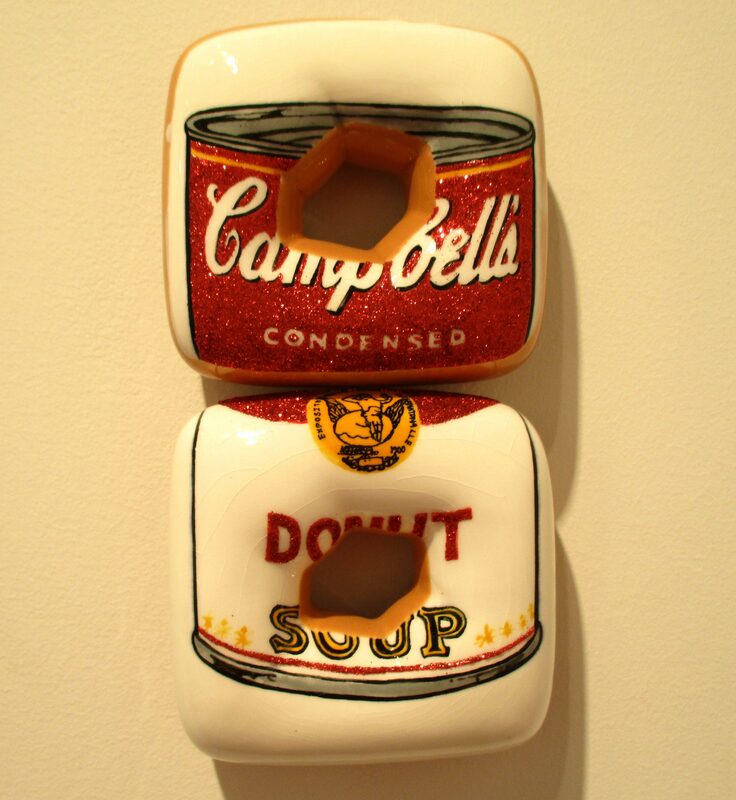 Aside from inspiring you to immediately hit up a Krispy Kreme, you’ll love how Kim incorporates the most recognizable motifs of favorite Pop artists like Andy Warhol, Yayoi Kusama and Jeff Koons into his various Donut-themed series. 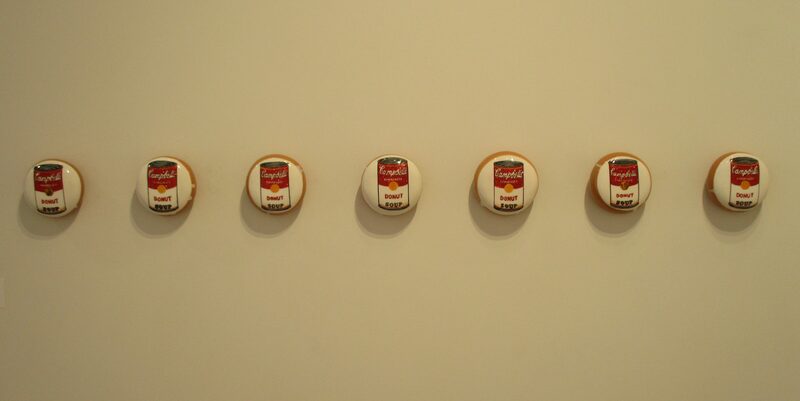 Kim has a field day riffing on Warhol’s iconic Campbell’s Soup Cans, which he recreates here as Donut Soup. Yummy. These ones look like Jelly Donuts to me. 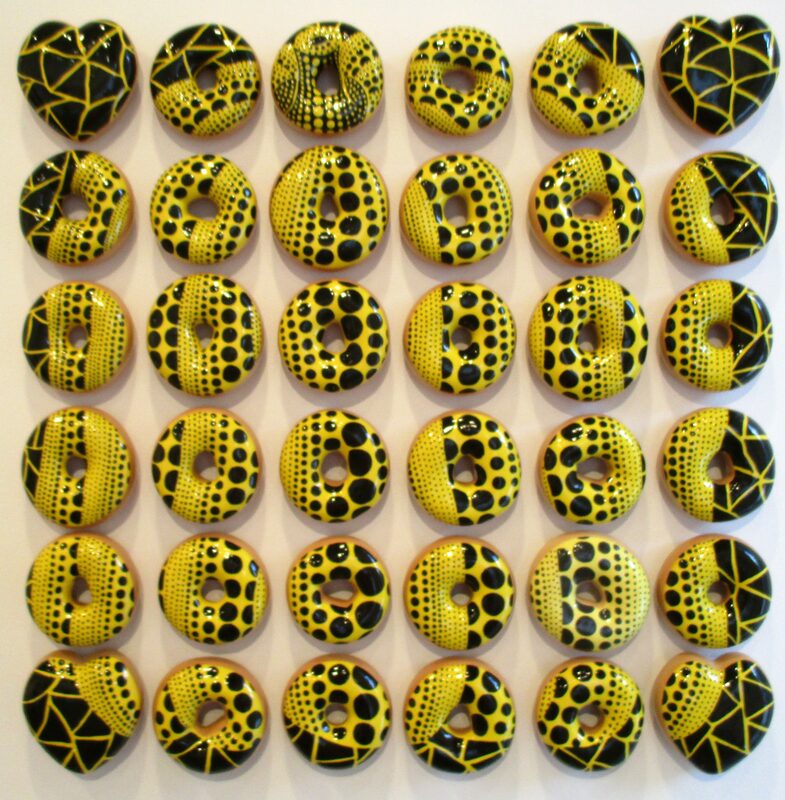 With Pumpkin Spice Donut, Kim references Kusama’s yellow and black spotted Pumpkins. 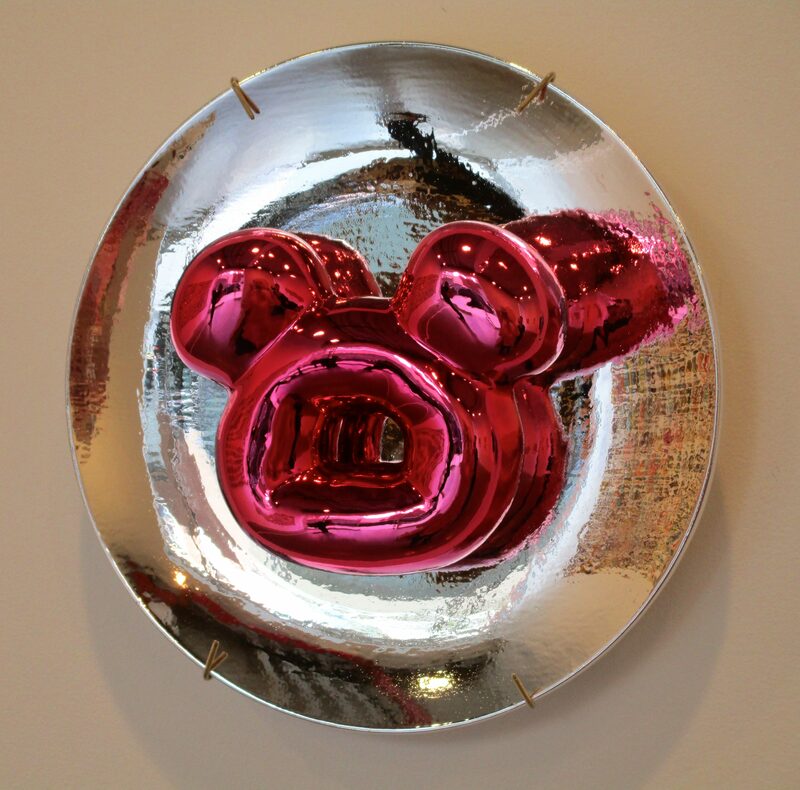 The colorful, mirrored-surface of the Teddy Bear-Head Shaped Donuts made me immediately think of Jeff Koons‘ Balloon Dog on a Plate. 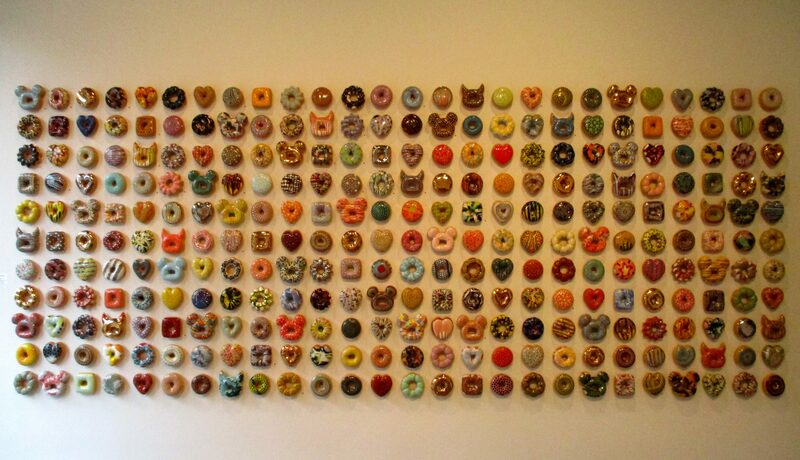 Buy, Sell, Hold – the Donuts! 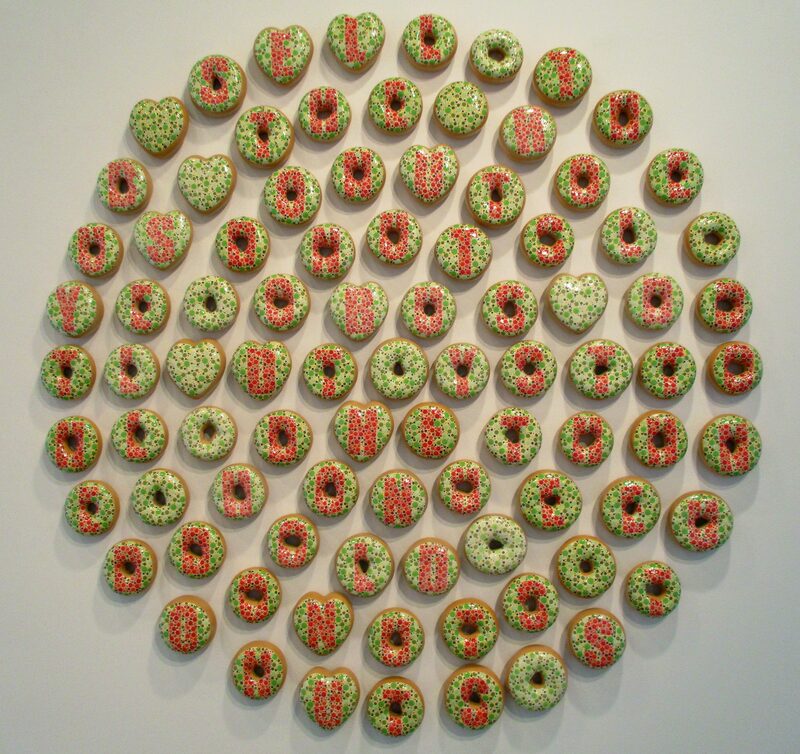 Here’s a Donut Grouping that pays homage to the Stock Market! Fun! 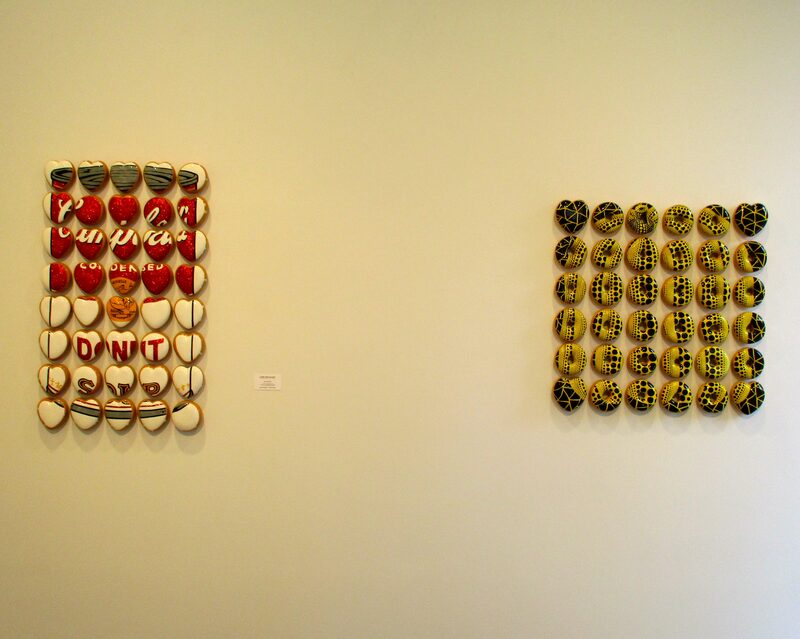 Make sure you stop by Lyons Wier to snap some selfies with these donuts before the exhibit closes in just under 2 week! 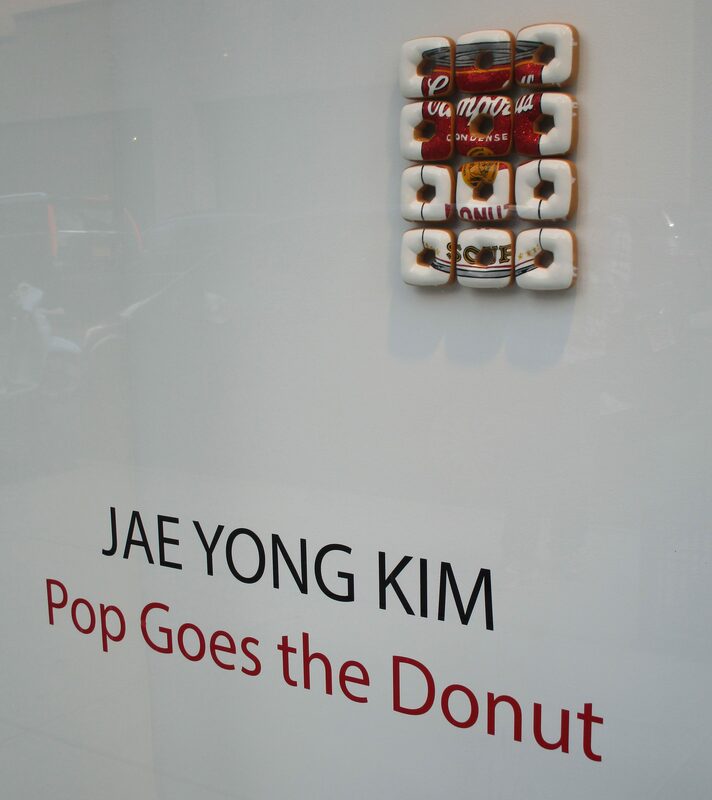 Jae Yong Kim’s Pop Goes The Donut will be on Exhibit Through May 14th, 2016, at Lyons Wier Gallery, Located at 542 West 24th Street in the Chelsea Gallery District. HAHA! 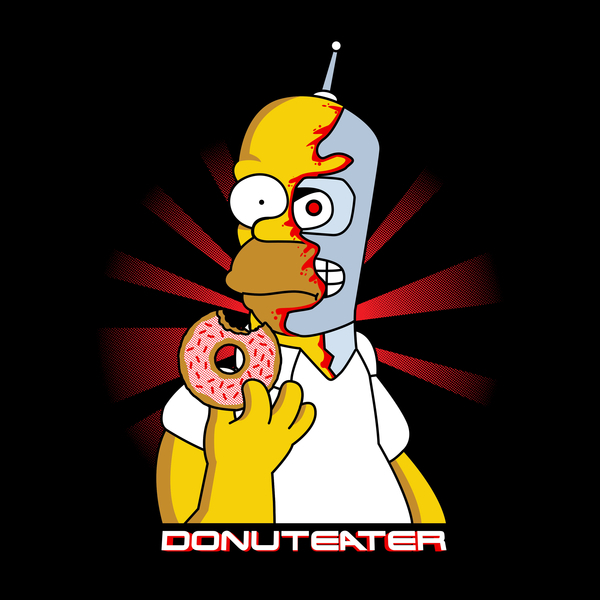 Donuteater; a Homer Simpson/ Terminator/ Bender Mash Up design by Droidloot is available on a T-Shrt for just $15.95, and also on lots of other cool stuff like Zip-Front Hoodies and T-Shirts for Dogs (I kid you not) at This Link Right Here. 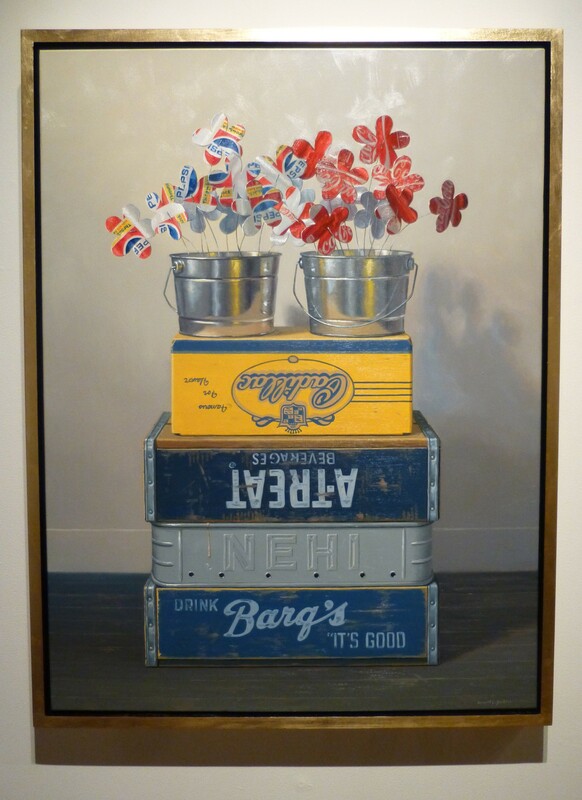 Robert Jackson’s Tinkering with Reality is a disarmingly fun exhibit of contemporary pop-realist paintings whose everyday subject matter lends them an element of the absurd. More than anything, this exhibit reminded me of the paintings of Robert Deyber, but without the obvious visual puns attached. 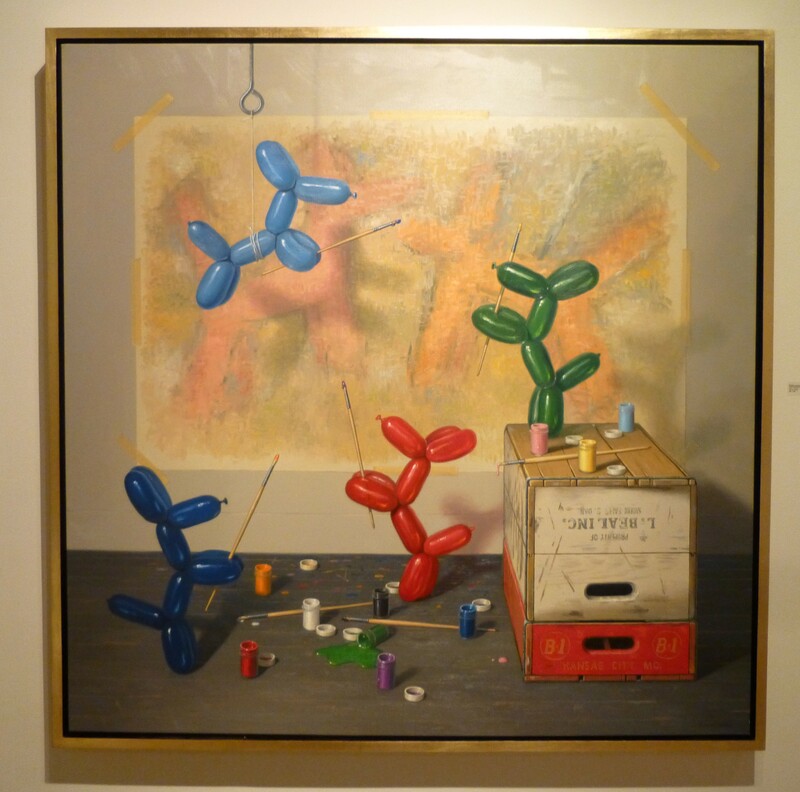 Robert Jackson’s paintings offer tightly contained theaters of absurd impossibilities that speak to the very act of creating itself. 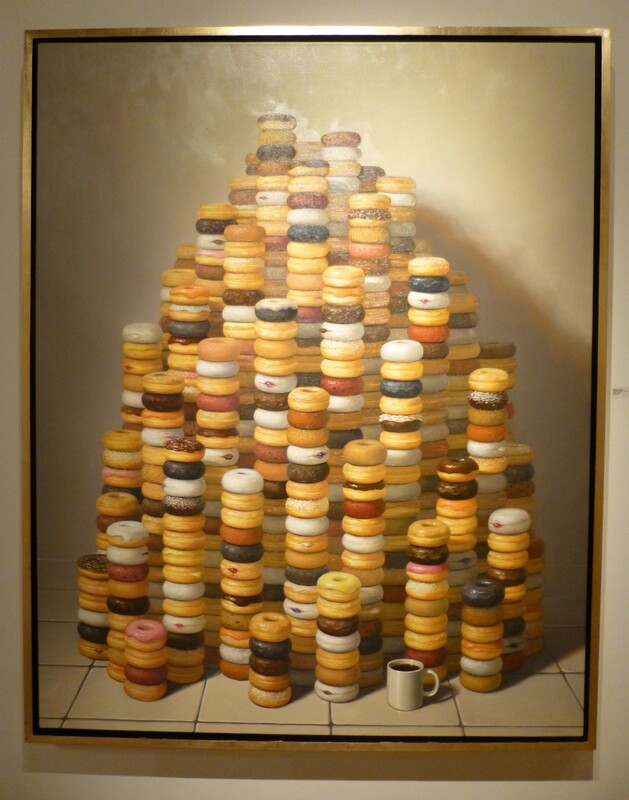 Jackson’s regular cast of characters includes unbelievably tall stacks of pastries and hamburgers, anthropomorphized apples, Oreos and balloon animals, as well as colorful wooden crates whose graphic faces flatten the picture plane even as they enhance the painting’s ‘trompe l’oeil’ effects. 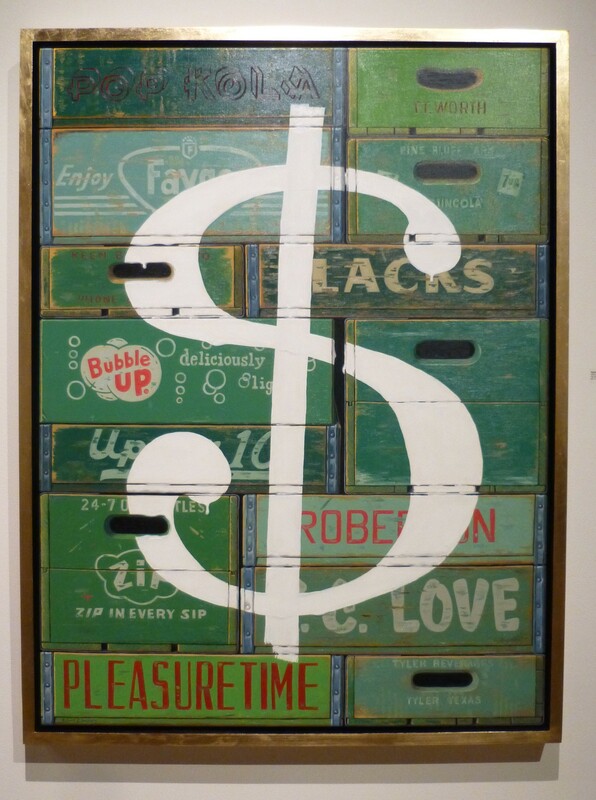 Jackson paints scenes that delight in their illusory spectacle as they navigate through painting’s loaded history. 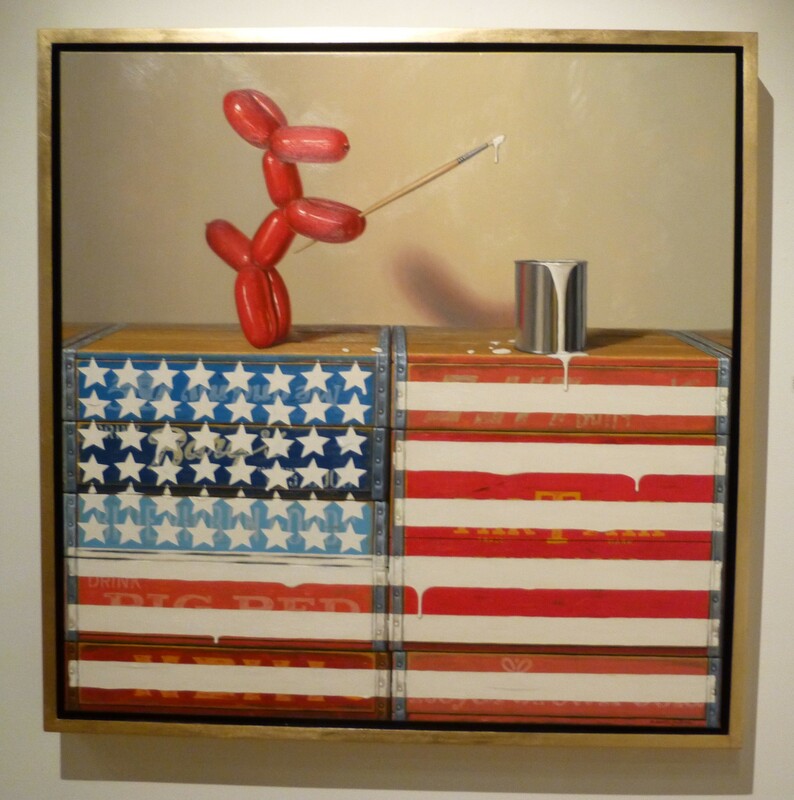 Jackson’s props lack traditional sophistication by designs – the silliness of a balloon dog or the artificial sweetness of an Oreo cookie lend a playful spirit to the philosophical conundrums that Jackson explores in his narrative-driven paintings. 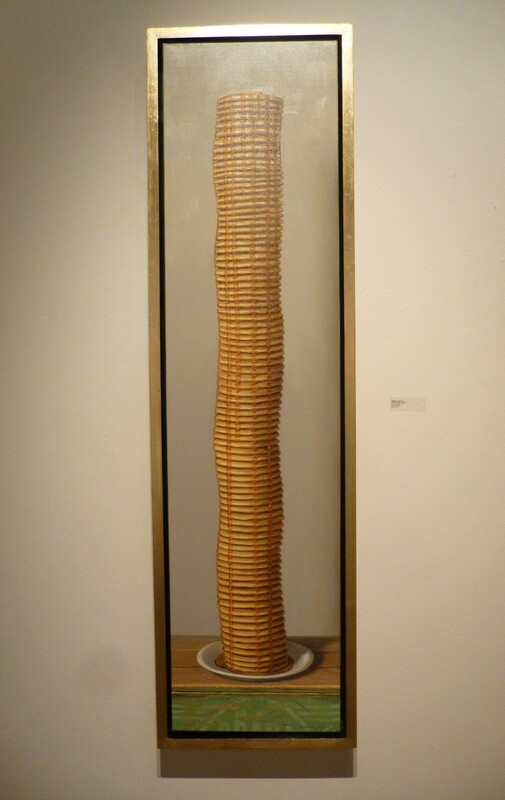 Robert Jackson’s transfixing work makes it easy for the viewer to suspend their disbelief. 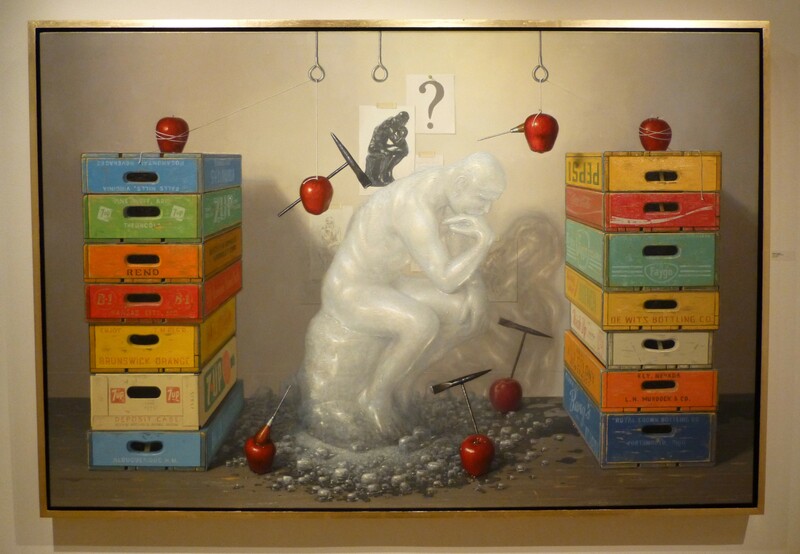 But there’s an element of self-awareness in Jackson’s paintings that makes the viewer conscious of Jackson not trying to simply fool, but to make the viewer think about the process of being fooled. Painted at human scale, Props looks like scene the viewer could walk into, pick up a burger and walk out of again. 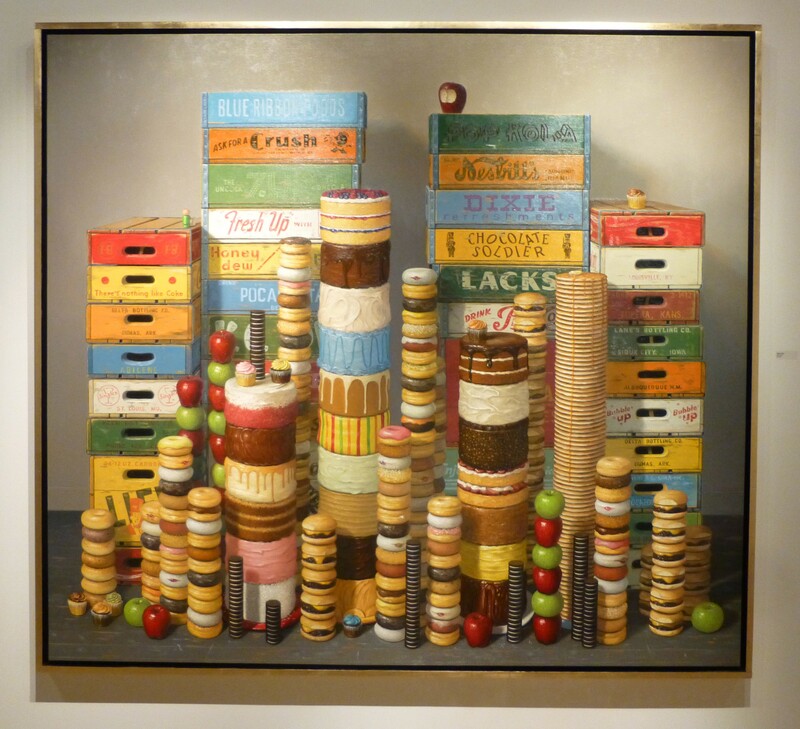 Jackson finds a way to cleverly imply his own presence in the work through the bitten red delicious apple on top of a Pop Kola crate, and the tiny green Fisher Price figurine on the stack of crates to the left. I also really loved the way Jackson references other works of art within his paintings, such as the homage to Rodin’s The Thinker, above. 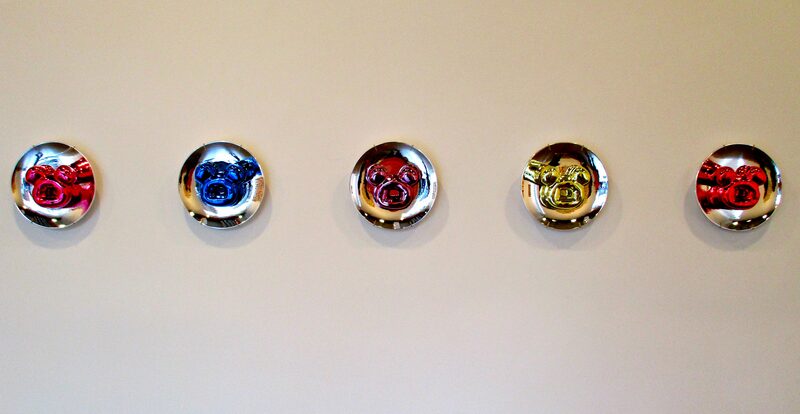 And of course you cannot talk about Balloon Dogs without thinking of Jeff Koons. 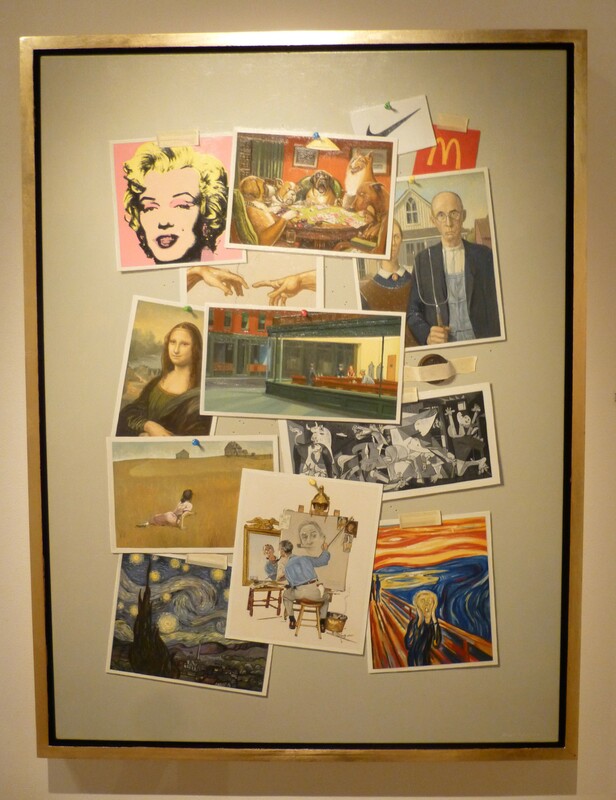 How many “Iconic” works can you identify in the painting above? Tinkering With Reality is one of my favorite current exhibits, and I recommend very enthusiastically that you check it out in person!